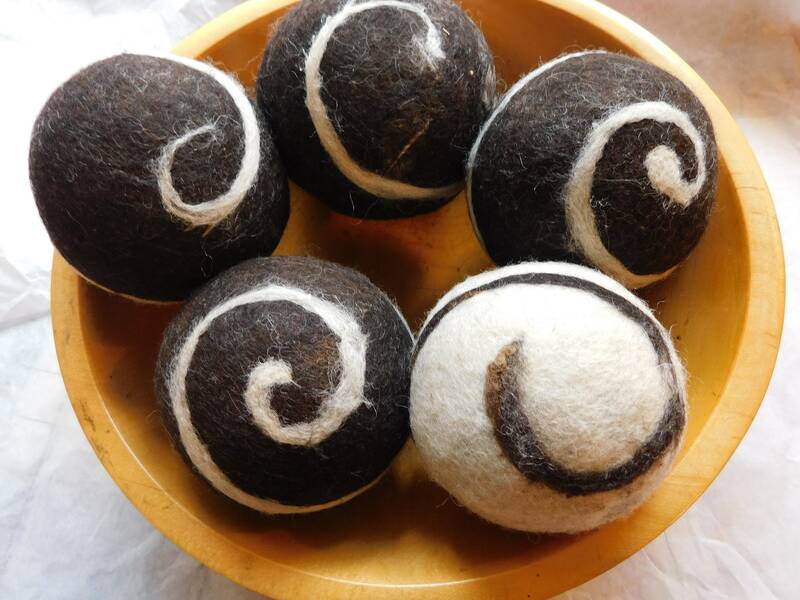 Wool Balls ~ For display , play, or laundry aid. 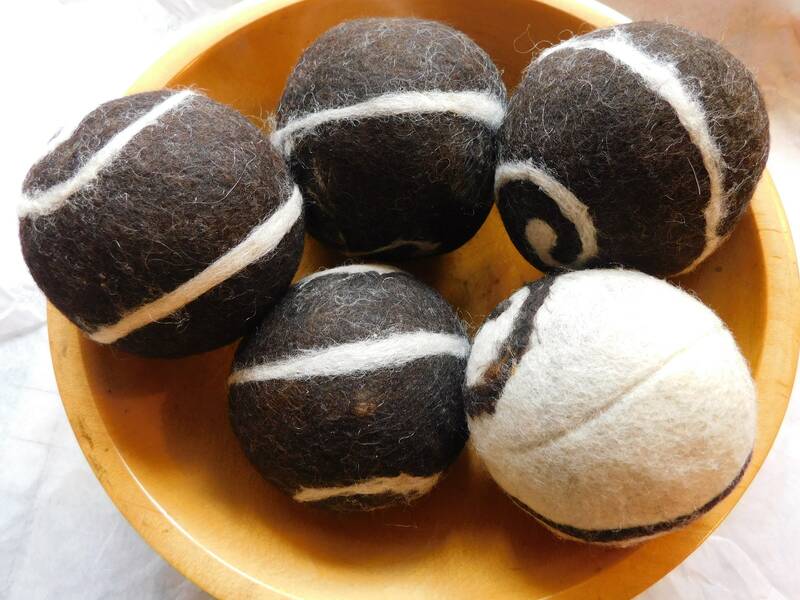 Wool balls made from the fleece of my black & white spotted Jacob Sheep. 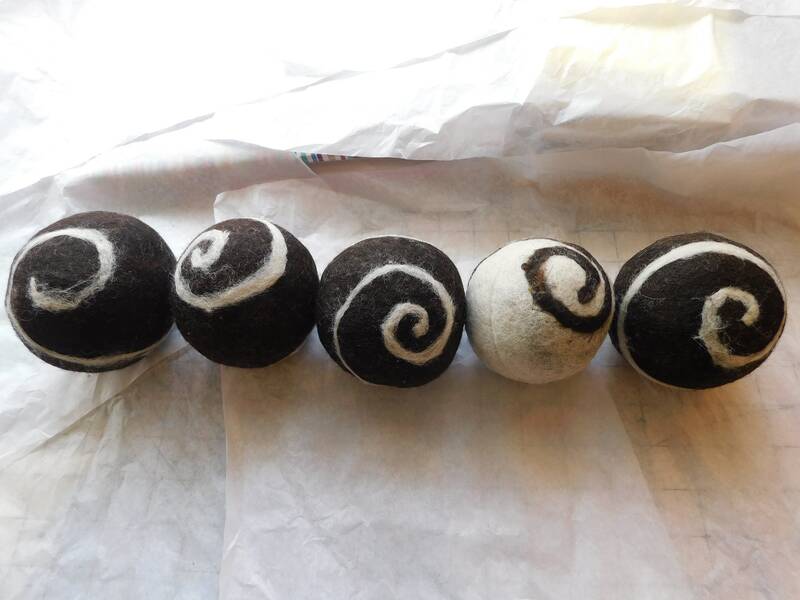 The wool balls are black and white , some are black with white swirls, some are the reverse, white with black swirls. 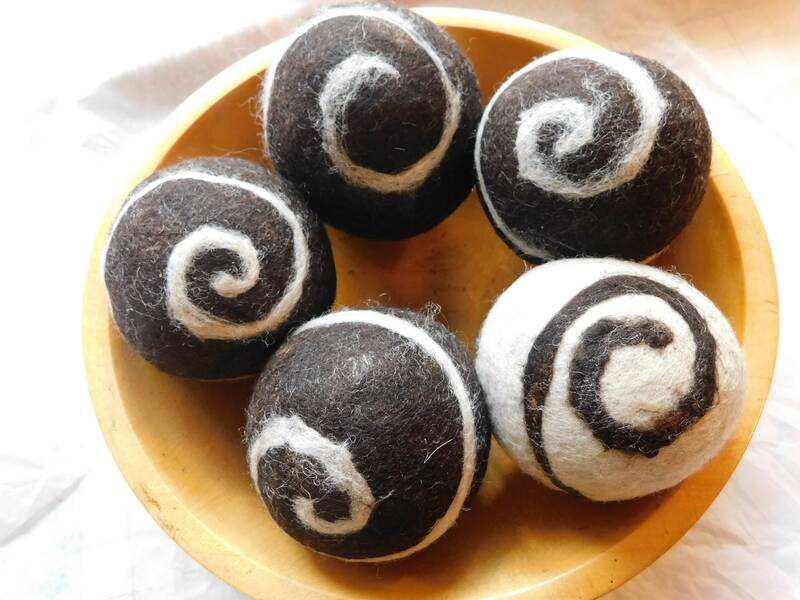 I love the look of these wool balls and display a bowl of them in my living room that is decorated primarily in varying shades of gray. 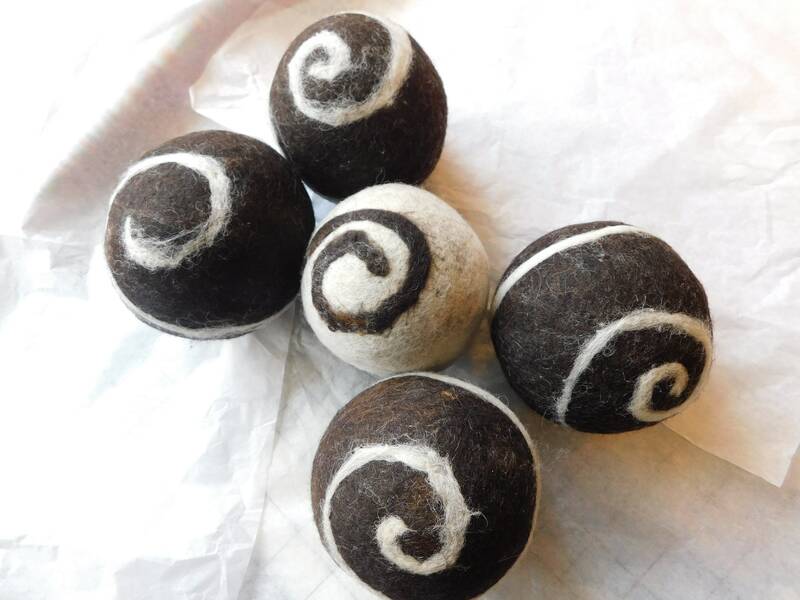 The balls add a touch of drama I appreciate, especially because they are made from the wool fleece of my flock of sheep , the sheep I love to watch from my windows as I work with their wool. These wool balls are wonderful baby and/or cat toys. Each ball has a jingle deep inside and since these are soft and washable toys you can't go wrong with using them for babies or kitty cats. My cats love to play with these balls especially after I spritz the balls with catnip spray or essential oil. Babies can throw the balls around, chew on them, etc., and after all that a baby or toddler can do to the balls, you can toss the balls in the washer to clean them up and use them as a laundry aid in the dryer when drying them ! If you're using them as dryer balls, toss at least 5 in the dryer with your wet laundry and the balls will keep the laundry separated as it tumbles in the dryer and also help reduce the static cling. If you desire scent in the dryer balls, simply add a few drops of essential oil to 1 or 2 of the balls. 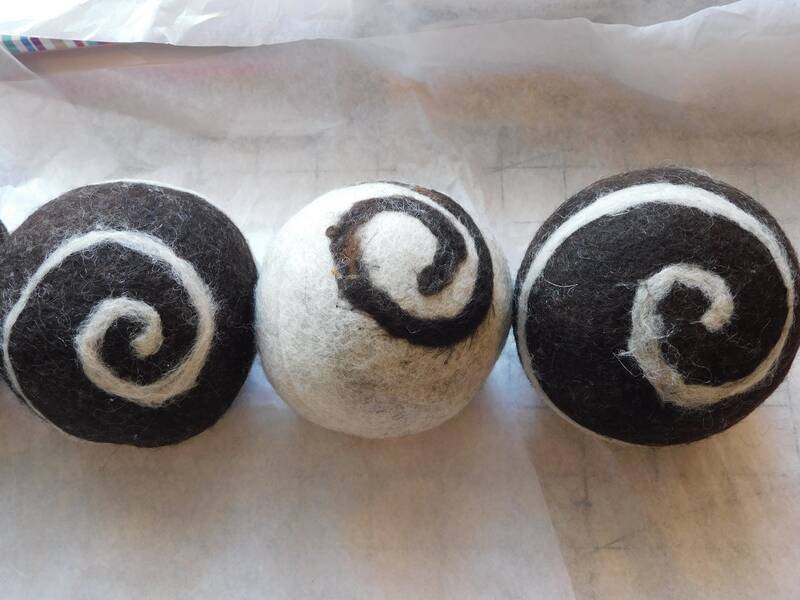 Wool dryer balls last indefinitely. I have been using the same 6 balls for several years now. I keep a wooden bowl of the black & white balls as decor. 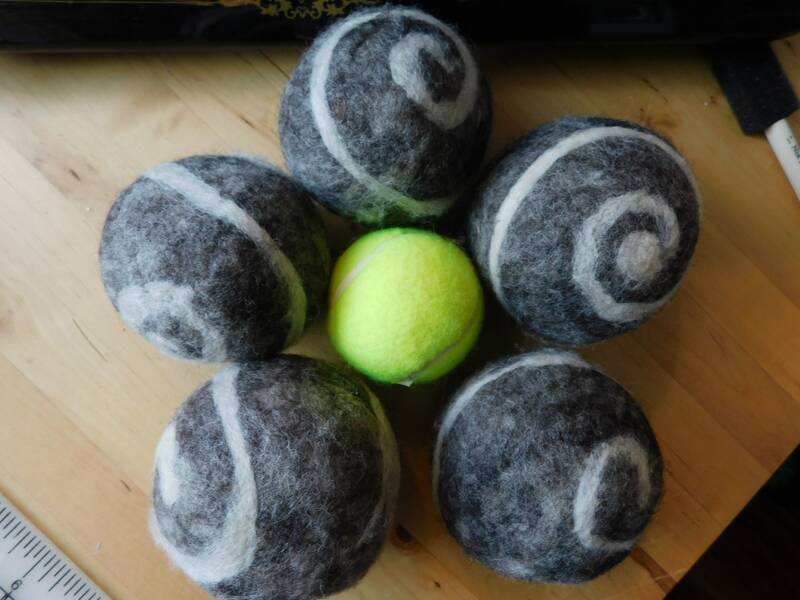 The picture with the tennis ball shows you the size of the wool balls. Right now I take money orders ( preferred ) or checks made out to me, Kathryn Burnson. The item purchased will be shipped via USPS upon receipt of a money order and within 5 business days of receipt of a personal check. I will notify the buyer via e-mail as soon as payment is received by me and again as soon as I ship the item to you. Items purchased will be shipped out via USPS. There is a $2.50 shipping fee for each item. I want you to be pleased with the products I make from the wool of my sheep.If there is a problem with anything you purchase please contact me via e-mail and allow me the opportunity to remedy it.